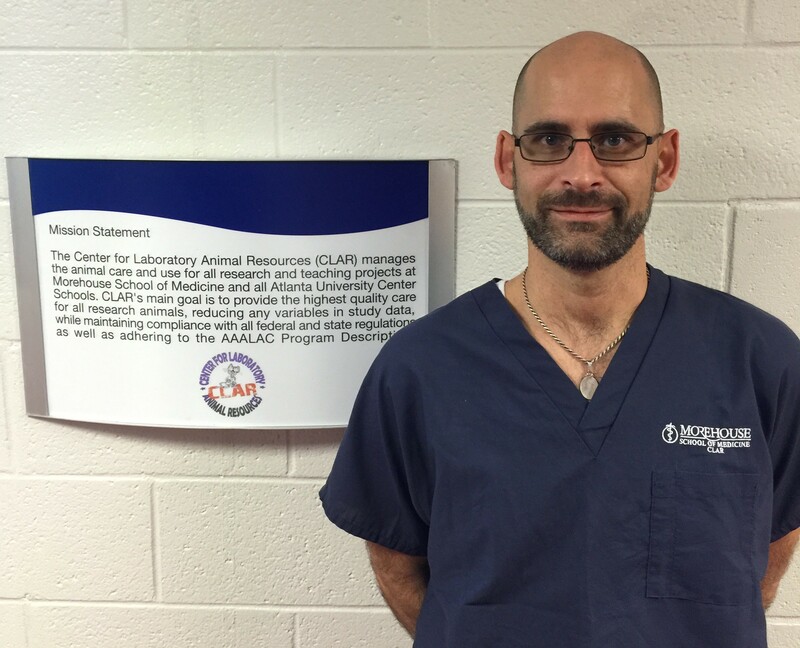 James Champion is a registered veterinary technician that is the Director of Operations of Morehouse School of Medicine’s Center for Laboratory Animal Resources. He has worked in animal research for over twelve years. He was also awarded the AAALAC International Fellowship Award in 2015. Since I was a young child, I have gravitated towards all animals. For most of my life, they seemed to be kindred spirits of mine. This passion for animals led me to veterinary technology. Although, I admit, I started as a veterinary technician so I could get experience that would eventually lead me to veterinary school; it turned into a fulfilling and exciting career. As life often demonstrates to us; our plans are meaningless. I had been working as a veterinary technician since I was sixteen, following that path until 2002. 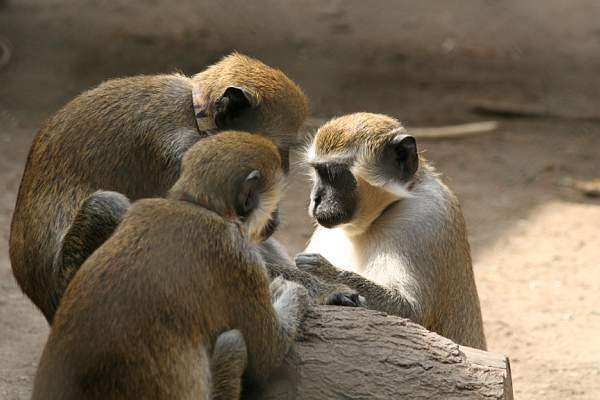 That is when a friend, after seeing a job posting at Emory University, asked me if I wanted to work with monkeys. Of course, my response was an immediate ‘yes’. That was when my career in biomedical research began. I was a veterinary technician for a research breeding facility where I helped to ensure all the animals were healthy and happy. No one warned me of the backlash I would experience when I spoke of my new career. I learned real quickly how hot of a topic biomedical research was. It was also, then, that my undesired shame for what I did was starting to manifest. I started to fear being targeted by animal rights groups, having a debate every time I discussed my career, as well as, fear that I was blindly supporting the use of animals to better human life. It soon became clear to me; we don’t talk about what we do. A great example of this was during a Christmas holiday, my cousin, who happens to be diabetic and has scoliosis, asked me, “How can you do that to those cute monkeys.” The ridiculousness of this question coming from someone who can directly observe the benefits of animal research was not lost on me. After the initial shock of being accused of doing something nefarious, I truly understood her motivation for her question. She had little to no understanding of how research actually works and how it is heavily regulated. Although my opinions of research are different than those that lack the understanding of the system, my drive within my field is not different from others. I have personally seen the positive results from research. From the longevity of my pets to the treatment that allowed my grandmother to live, reducing the debilitating effects of the stroke she had. In addition to that, I would not have been able to travel to England and Africa this past year without contracting any diseases without the vaccines and medications I was provided. I wouldn’t have been able to travel if I had not had back pain injections last year, allowing me to stand upright and be able to sit for the length of time that was required for my international travel. For me, I feel like I am contributing the improved welfare of the world around me by participating in the industry that trains our future doctors as well as contributes to the medical advances in our understanding and treatments of diseases. Unfortunately, this was not quite enough for me to be at ease working in this field. After much soul searching, I found my purpose. I was able to reconcile my doubts and put all of my energy in doing what I feel I was meant to do. I became the advocate for our research animals. This change was not a result of a promotion or specific instruction. It was clear to me, if I was not in my position, putting the animal welfare as the utmost importance, who would? If you asked anyone in research, you would find a high percentage of people that would gladly give up their careers if it meant not needing to use animals. Unfortunately, there isn’t a suitable alternative, at least, not yet. Until that day comes, we in the research industry will continue to provide care for these animals, to which we owe much gratitude. All current medical advances (vaccines, antibiotics, treatments, etc.) are all due to the animal heroes that have provided the data needed to combat diseases in both humans and animals. Despite the differences we humans have in our opinions, it isn’t our duty to change someone’s views. That is an internal and personal process and journey upon which we must embark alone. Our duty as bastions of animal welfare is to proudly discuss our jobs as animal care givers. Most people do not understand the process for applying, planning and initiating any animal studies. If more information is provided and more openness is observed, less people may have as strong of negative impression of biomedical research as they do. At this stage in my life, it has become clear that I must be a part of the ‘coming out of the research closet’. I began to speak at conferences for research staff as well as veterinary technician conferences, speaking of the great work we do in research. By inspiring our colleagues and openly talking about what I do, I feel the path is set. Why do I think veterinary technicians are needed in research? I may be biased since I am a veterinary technician that has become the Director of Operations of an animal research program, but I feel veterinary technicians are needed in research. Most veterinary technicians have big hearts, making them compassionate care givers with an innate ability to recognize pain and suffering. In addition to that critical quality, veterinary technicians are able to triage cases to ensure intervention is provided only when necessary. Lastly, most veterinary technicians are able to handle euthanasia (although the worse part of the job), understand the balance between costs versus care. They do this daily; taking care of others’ animals while their own are home waiting for them. Being an animal lover, I am often confronted with consternation that I am able to work in this field. Although the inquiry can be offensive because it implies that I condone hurting animals in some way and that I do not care that we use animals for our needs. If you know someone that is an animal lover (as are most of us that work in this field), ask yourself: “Is this job easy for someone that loves animals?” If they love animals, this career must not be easy for them. Instead of asking them how they can participate in this work, try thanking them. Thank them for being there 365 days a year to ensure these animals do not suffer and the best care possible is being provided. Thank them, also, for combating emotional fatigue to ensure we are steadily studying disease and its treatments. Lastly, the animals that make this sacrifice should be thanked. This gratitude can be shown by providing these animals with the best care possible. As a result, our scientists get the best data possible. Biomedical research is a difficult, yet rewarding career. It requires high standards of care and compliance with regulations. It also requires compassion that is tested every day. For those that work in this field, they must understand the value of animal welfare and how that affects high quality data. Without the care of qualified and compassionate staff, this data would not exist and the research community would not be able to provide the world with medications, treatments and vaccines. The only way to bring the debate to the forefront is to talk about it. Be proud. Talk about what you do. Get involved and share your experiences. Posted on December 8, 2015 by EditorPosted in Guest Post, News, Outreach NewsTagged Guest Post, James Champion, vet, veterinary technician. Previous Previous post: Where should US chimpanzees live? I love love love this article. As a vet tech who used to work in medical research, I know the struggle of trying to explain yourself to people, especially other vet techs, that don’t understand what you do. I worked with pigs, and I loved those pigs and I miss them now that I’m not with them everyday. I used to tell people that I was honored to take care of those pigs that were a vital part of a process that saved many lives. Thank you for putting this out there and good luck to you and your monkeys! I love the term ‘Science Soldiers’. I may have to use that. Without folks like you that take care of these wonderful creatures every day, the world would be a much darker place. Thank you for what you do! I am a PI in the field and had a very similar experience, as I am sure most of those who work in the field have, and I came to the same conclusion: we need to be more open about what we do. Most people have some fairly dark ideas about what we do – and I have found most are surprised when I talk about the dedication we have to the health and care of our research animals. Not to mention the regulation of their care. It would be nearly impossible to work in this field and not be an animal lover…we spend hours and hours interacting with them and caring for them. I refer to my animals as “science soldiers”, they have a job to do just like we do, and we are very grateful to them for doing that job. Thank you James for all that you do for the welfare of animals in your care, and for posting this article. I applaud you!